Rarely does Sri Lanka convict Buddhist monks. 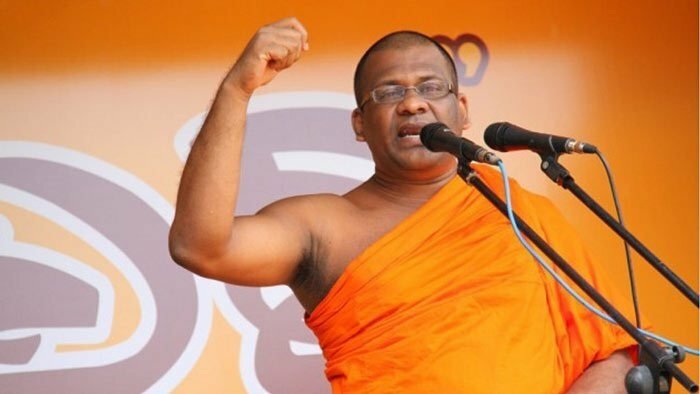 But few days back a court in Sri Lanka made history when it convicted Galagoda Aththe Gnanasara, the controversial leader of Bodu Bala Sena (Buddhist Power Force) who is referred to as ‘Thero’, The Venerable, and sent him to jail. Scores of his followers, mainly Buddhist monks, were reciting Buddhist prayers when he was being arrested and packed in to the police vehicle. When the civil war came to an end in May 2009 I was still a final year undergraduate at the University of Peradeniya. Peradeniya was miles away from the war zone. The only venues that supplied us with details about the happenings in the war theatre were the television channels stationed in the South, self-censoring the civilian casualties incurred and feeding to the Sinhala nationalist jubilation of the times. And on the other side were websites like Tamilnet and Puthinam run by parties sympathetic to the LTTE releasing carefully filtered out reports singularly focusing on the deaths of civilians caused by the military leaving no trace about how the top leadership of the LTTE was recruiting children and adults, despite knowing so well they had already lost the battle or how the civilians who were trying to flee the war zone were shot down by the militants. Household debt has plagued the North and East since the war ended in Sri Lanka. Activists and journalists have long highlighted the consequences of predatory credit and the devastating indebtedness faced by the war-torn people; from rural indebtedness, to debt accrued from the Indian Housing grants to the debt trap with lease hire purchasing. As the people of Sri Lanka complete the voting process for the Parliamentary elections of 2015, PRADEEP JEGANATHAN reflects on his country’s history and politics. Read the rest of this piece in Colombo Telegraph. We’ve always had our mother. She is Lanka. That is the third thing I know about my country, and when I say, our mother is Lanka, or Ilankai or Eelam (for that too is a name for Lanka), I do not mean it in the sense of an inanimate goddess that is to be adored, appropriated and used as a cover for racism, violence and inequality. No, I mean it in the sense of Lanka’s lament, in the great songstress’ lyric, “Deddahas Pansiya Vasarak. (For 2,500 years).” In this beautiful song, Nanda Malini sings Lanka’s lament, her almost helpless sadness and deep grief, at the robbers and killers she has given birth to, who have then become big men and women, clinging to power by selling her name. Pradeep Jeganathan is currently Professor, School of Humanities and Social Sciences, Shiv Nadar University. campaigning, exciting, tense, nervous, delirium-invested, holding training sessions on the verendah for the immediate neighbouhood, as nobody but appa had voted in any previous presidential election, strangely agreeing with appa on politics for once, passing on all the wild gossip about the mr family, nightmare riddled pre election nights, sleeplessness, inducing drinking, exhilarating, liberating, cautionary, educating vasuki’s children about the elections ( they are keenly interested), near addiction to fb and quarellling with totally unknown friends on it, while another plethora of unknown persons writing in to befriend me, baila sessions, holding candle lit vigils for assassinated journalists, being connected to the universe on election night through thiru, who was on every tweet, every note, every social bleep, planning, writing, tasking for the future, doubts, setting off crackers, taking to singing, questions, pondering profound political questions on the nature of the state, reforms or revolution, gramsci’s historic bloc, not stopping at paradigm shift as most liberal commentators have done with this over used and abused term, not bothering with muslim bashing in europe over charlie whatever, in fact, just a wee bit short of visionary. no revolution, it is toward ……. Of the many pieties that have been promoted in the Western media in the aftermath of Maithripala Sirisena’s victory over incumbent Mahinda Rajapaksa in the recent Sri Lankan presidential election, none has been more cherished than the notion that Sri Lanka is now on board with “democracy.” This claim is counter-posed to Sri Lanka’s recent cozy relationship with China and other authoritarian countries. A new Cold War is supposedly being fought, with Sri Lanka’s election reduced to its strategic relevance to policy makers.